With the earlier paint job I used Lacquer spray paint, which is quick to apply but not very durable. After a few short years the paint was worn through where cables rubbed the lugged steel frame. Powder Coating creates a less toxic and much more durable finish, but it requires specialized equipment and experience to apply. Fortunately, my friend had just added powercoating gear to his shop and needed a 'test' frame or two to learn with. Much quality time was spent with the sandblaster, emery cloth and Scotch-brite pads to remove the old paint job. Then I spent even more time choosing the new colors for the bike. 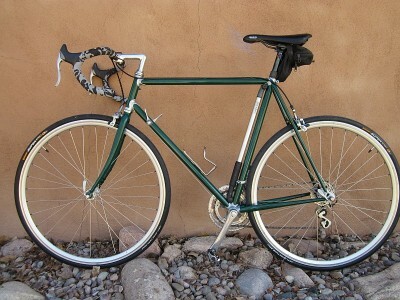 I finally settled on British racing green for the tubes and Silver for the lugs, with a clear coat over all of it. I think the time invested was well worth it, but it was quite a lot of time as we were learning as we went. I then dropped off the fork, frame and a box of parts at a LBS (Local Bike Shop) to complete the overhaul and replace badly worn bits. With it's glossy new look my road bike is calling out for new bar tape, and it is ready for many years and several thousand more miles of riding. The next time you look at that dirty and neglected bike in the corner of the garage, maybe all it needs is an overhaul and a clean up. Even a new powdercoat finish on an old bike frame can be much cheaper than buying a new bike. That "perfectly good" older bike probably only needs a little TLC to carry you for many more miles.